Dalton in 2015 and 2018, now swinging into action! Dalton is a bright, inspiring 7-year-old boy who has been a part of our community since he was diagnosed with leukemia in April 2015. Dalton has undergone a three-plus year treatment plan that required countless hospitalizations and clinic visits. His father actively serves in the U.S. Navy, but had to stop working at the beginning of Dalton’s treatment to help care for his son. Dalton’s parents turned to family reach when the loss of income and growing out-of-pocket expenses made providing for their young family of three nearly impossible. Thanks to your generosity, we were able to provide a grant to help pay for the family’s rent and give them a sense of security by allowing them to stay in their home. Dalton’s parents, along with his two siblings, have continued to be tremendous supporters throughout the ups and downs. 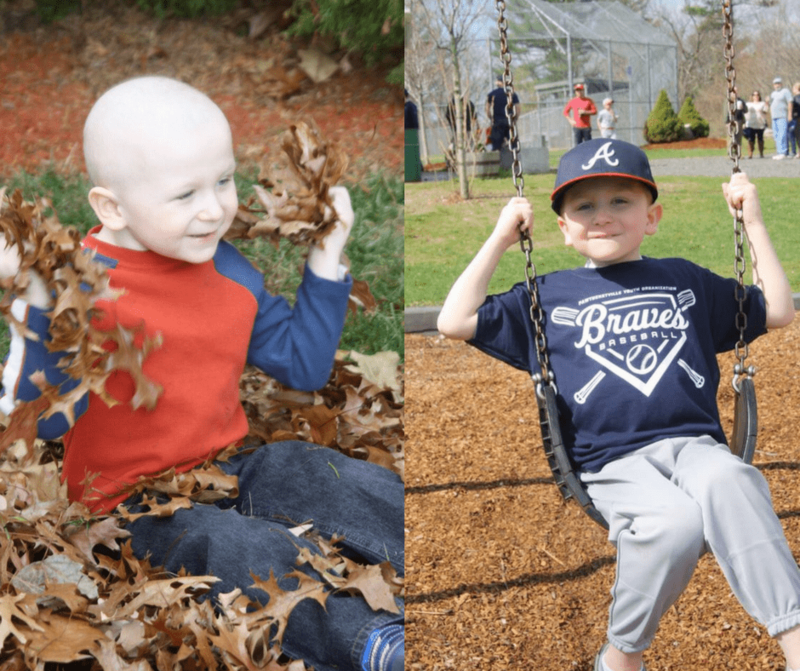 We are happy to share Dalton had his final chemotherapy treatment this past month! He is now enjoying school and excited to play on a t-ball for the first time with his best friend. A true full circle moment for him and his family as Dalton took to the field this past weekend. “We can almost see the finish line and, while scary, it feels amazing,” shares Laura.